The ICET region offers outstanding opportunities for marine tourism, and paddlesports are a rapidly growing element of the marine recreation and tourism sector. Despite growth in popularity and economic impact, paddlesports have not been part of any collective tourism strategy. There is an opportunity to leverage marketing and awareness efforts aimed at paddlesport tourists through the Trans-Canada Trail - a recreational trail which is becoming a world-renowned tourism asset. The project developed a plan for a 257-km marine route designed for paddlecraft and other small, self-propelled boats. 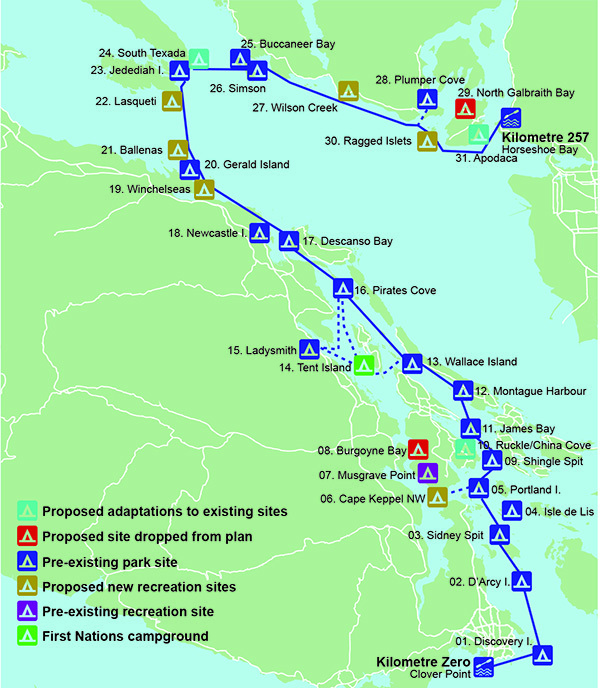 The Salish Sea Marine Trail will be a significant water route component of the Trans Canada Trail. The plan includes new recreation sites in the Winchelsea Islands, South Ballenas Island, and Wilson Creek near Sechelt. Service hubs will be created, combining options such as food, accommodations, supplies, transportation, rentals and tours as well as options for day trips. Development of the trail and new recreation sites will attract new marine trail visitors and the creation of service hubs will connect local businesses with marine trail users. The Salish Sea Marine Trail will help to foster new business development, package services, features and attractions around regional hubs and will raise the profile of many island and coastal locations.